Are you facing a terrible disease or providing care for someone who is? Have you recently experienced the loss of a loved one? Are you struggling in your faith? Inspirational speaker Viki Scherer from Decatur, Illinois, addresses all of these questions in her talk “You Can Plan For The Future, But You Can’t Predict It.” She shares about her journey of faith and her husband’s battle with ALS, Lou Gehrig’s disease. A speaker for Stonecroft Ministries, she has spoken in nearly 100 cities for their Christian Women Connection groups as well as at churches, women’s banquets, grief support groups and ALS support groups. Her book Where There Is Faith He Is With You provides encouragement and assurance that God is with you in all circumstances. It is the powerful story of Viki’s life of faith and her husband Doug’s battle with ALS. There are amazing accounts of God’s faithfulness and provisions during difficult times. A “gas angel” appears, financial blessings arrive and equipment is supplied. You will be touched by the tender moments in this love story as Doug and Viki face the disease and its crippling effects. In 2009 she was named a National Caregiver by the ALS Association. Viki is hosting a tour to Israel Sept. 16-25, 2019 with departure out of Chicago. She is working with Imagine Tours & Travel, LLC and has secured a price of $3815 (per person double occupancy). This is a great price! It includes round trip airfare, deluxe motor coaches, first class hotels, entrance fees to sites visited, a wonderful Israeli tour guide and headsets to hear him, breakfast and dinner daily plus all taxes and gratuities. Travel insurance is not included. 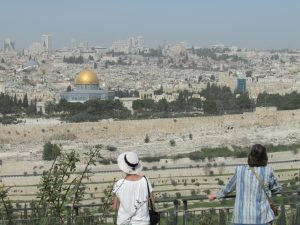 Viki has packed this tour with a wonderful itinerary of many Biblical and historical sites. You will walk where Jesus, His disciples and the prophets of old walked. Your Bible will come alive!